As a Group that employs over 190,000 people, we have a direct impact on the communities we operate in around the world. Supporting these communities and people is a key part of our corporate responsibility. Capgemini NA colleagues have hearts to give, and this is exemplified in our consistent cadence of giving throughout the year. We strive to have a positive impact on the communities in which we live and work, which increases year over year. We have selected 17 Non-Profits in North America to partner with. The mission of each of these Non-Profits aligns with the United Nations Sustainable Development Goals. 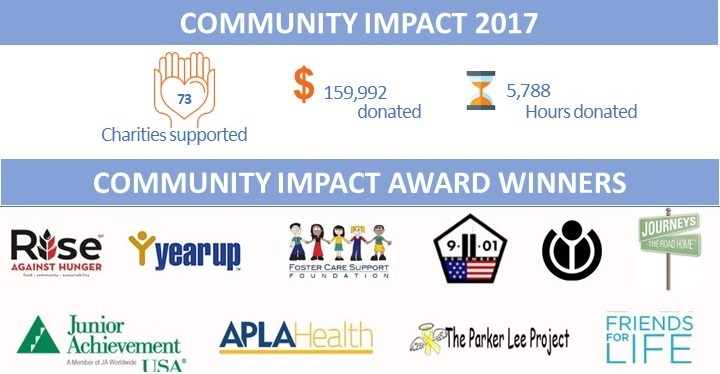 By working with our clients to support these charities, we are able to build stronger relationships and make a greater impact in our communities. We do this through a variety of programs throughout the community led by our Employee Resource Groups, client partnerships and corporate programs. Capgemini NA is donating time to support the social media and marketing efforts for four non-profit organizations. Our efforts allow for greater impact in the organizations’ efforts with the intent to drive increased volunteer and fundraising support. Every year, the NA Corporate Responsibility team grants ten (10) $500 awards to support charitable organizations in the United States and in Canada. This is a unique opportunity for Capgemini to recognize employee efforts in their local communities. CARES (Community Action, Responsibility, and Environmental Sustainability) Employee Resource Group has the mission to enhance, support and advance Capgemini’s community engagement and environmental sustainability while providing resources to individual employees to pursue the areas of corporate responsibility and sustainability that are important to them. CARES actively supports the ERG program in their efforts throughout the year to drive community service projects. Capgemini Cares Day is our annual day of service where employees volunteer together, with clients and partners, to help improve the communities in which we live and work. Do you want to participate? Look for communications and invitations in 2018. If you are interested in helping to plan an event in your city, please contact NAR Community. 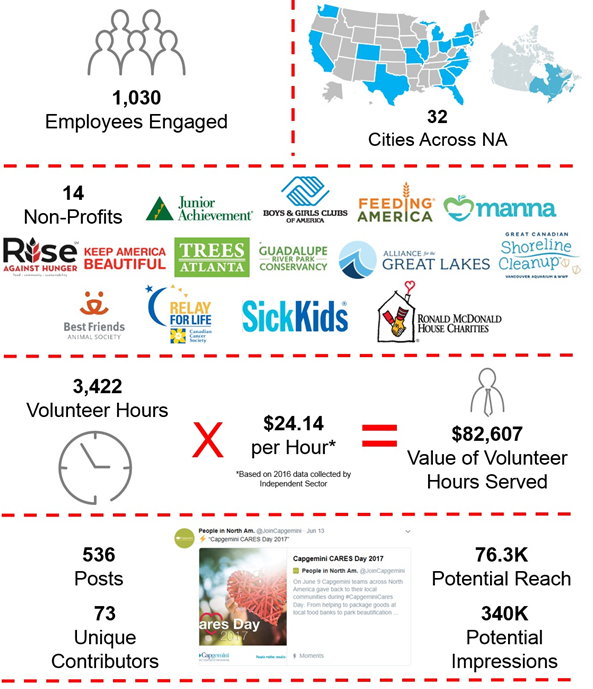 In 2013, we launched our annual day-of-support across North America: Capgemini Cares Day. On June 9, 2017, more than 1,000 team members engaged in community support across more than 30 cities. In all, we supported 14 organizations, including Feeding America, Boys & Girls Clubs of America, and Ronald McDonald House Charities. View photos from Capgemini Cares 2017: Capgemini Cares Day 2017 photo gallery.